If your home has more than one clogged toilet, bath, shower or sink you may have a clogged main sewer drain. This condition can cause a foul-smelling mess if plumbing fixtures upstream of the clog continue to be used and sewage begins to flow out of lower-lying drain openings inside your home. You can use a mechanical drain cleaner, also called a plumber’s auger or drain snake. You can use a sewer jetter attachment for a household pressure washer. In general a sewer jetter attachment costs less, can unclog a drain faster, and allows easier cleanup after the job is done. The advantages of each system are discussed in our article about the differences between a mechanical drain cleaner and a sewer jetter. Regardless of whether you use a mechanical drain cleaner or a sewer jetter attachment, the process to clear a clogged main sewer drain is almost the same. 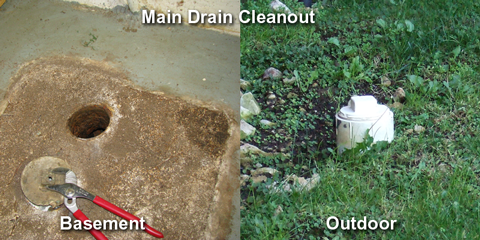 It’s often best to use your main drain cleanout when clearing a clogged main sewer drain. This is because the main drain cleanout is usually located where it’s easier to set up power equipment nearby and cleanup after the job is less of an issue. Main drain cleanouts are normally found either outside the front wall of your home between your home and the city sewer line or septic tank, or in a basement, crawl space or garage. They can be located on horizontal or vertical drain pipes and are usually identified by a metal or plastic cap with a square fitting on the top as shown in the images above. 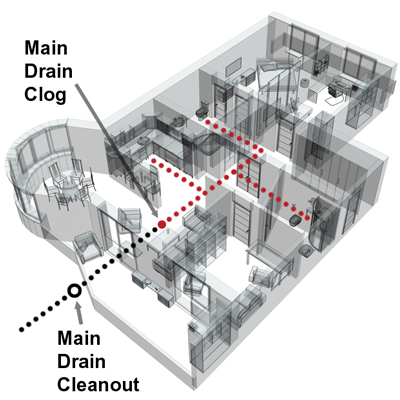 You can also use an indoor drain cleanout such as an inlet under a sink that’s upstream of the clog if you follow the precautions discussed in our article about sewer jetting indoors. Set up your equipment with safety in mind. If using electric equipment, plug it into a GFCI (ground fault circuit interrupter) outlet to prevent injury from electric shock. 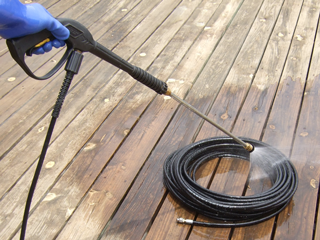 If you’ve got a gas-powered pressure washer, attach a high-pressure extension hose between the pressure washer and spray wand if needed to operate the gas engine outside. Even if you’re an experienced user, review and follow the safety instructions that came with your equipment. Wear fluid-resistant work gloves and eye protection. If you’re using a sewer jetter attachment, connect the jetter coupling to your pressure washer trigger gun or spray wand. Then lay out the sewer jetter hose in a loop that runs out and back to the cleanout opening. Feed the tip of your drain cleaner into the drain opening. If you’re at a tee fitting be sure the tip points in the direction of the clog. Guide the line about a foot into the opening before you squeeze the spray wand trigger to release the flow of water. You’ll feel a tug as the jet nozzle starts to pull itself into the drain. Continue to feed in the sewer jetter hose as you squeeze the spray wand trigger. For effective cleaning, every few feet pull the hose back about halfway and then continue moving forward. Should the nozzle reach a drain elbow or other transition and the jetter hose stop moving forward, pull back a foot or so and then move forward again until the nozzle passes through. You can also release and then continue to squeeze the spray wand trigger to create a pulsing action to help the nozzle move forward. Listen for a surge of liquid as the clog clears, and then move a foot or two back from the cleanout opening momentarily to avoid any splashing liquid. After you finish cleaning the drain, pull out the jetter hose. 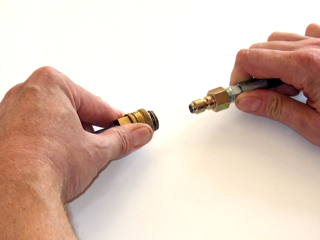 Use care to release the spray wand trigger and stop the flow of water before the nozzle reaches the cleanout opening. 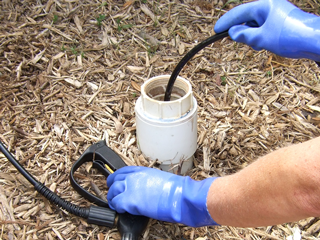 After you remove the sewer jetter hose replace the cap on your cleanout. Because a sewer jetter attachment has no moving mechanical parts, you can thoroughly clean it with the gentle nozzle of your pressure washer after the job is done. After cleaning, inspect the hose and fittings and replace if damaged or worn. Then hang the coiled sewer jetter attachment in your garage or shed, away from direct sunlight, children and pets. You can find more sewer jetting tips and information on the the Clog Hog website.